A draw indicates that the two teams playing were equally matched and that there is no difference between them. While this might not be entirely true of Arsenal's trip to the West Midlands, I think we saw a little bit of the old Arsenal today. The 'old Arsenal' isn't entirely bad. I actually got up from my seat (at home, 3,360 miles away) and stood for a small portion of the second half because it actually got quite exciting for a minute. I thought that, after conceding the first goal for the first time this season, we were starting to mount one of our semi-famous comebacks from years past. It wasn't to be. The first half wasn't so much painful to watch as it was boring really. It was a bit like watching Jack Wilshere run through mud playing piggy in the middle. I almost wrote a blog last week about whether Jack was getting targeted, kicked a lot and not getting protection from the ref or just flat out falling over a lot. After the West Brom game I think it is a bit of both. For being tagged the 'bully' most of the time, he does tend to go down quite easily, but it would be unfair to not point out that he does get kicked... a lot... more than any other player I think. I was watching him throughout the game and perhaps it's because he spends a bit longer on the ball. Arsenal play their ticky tacky, one touch passing quite often, and he tends to take that extra touch which gives the opposition a chance to get into him. He doesn't dive and he doesn't try to get penalties by play acting, so I don't have a huge problem with him, but I do worry about his chunky little legs sometimes. Perhaps it's the name Jack that installs a bit of a parent instinct in me, but I can't help but look out for the poor lad. 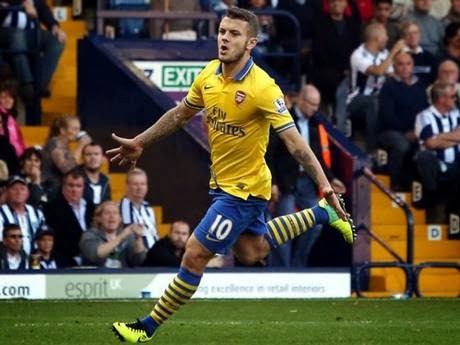 You just want to jump on the pitch, grab him, hide him behind your back and yell; "Stop pushing my Jack! I'll be telling your Mum, just you wait!" A lot of the attention was naturally on Wilshere this weekend due to this weeks reports of him smoking outside a nightclub. He didn't really put in the sort of performance to shut the critics up, but I am glad he got the goal. That will go some way to getting people off his back, while also giving him a little bit more confidence. Hopefully a solid game or two for England next week will put him back on track this season. While this 1-1 draw against West Brom takes the wind out of our sails a touch, we are still sitting top of the Premiership in October. This time last year we were shitting ourselves in 5th place! 5th! Can you imagine? I liked the way we kept possession and kept going forward today. Most of all I liked the way our players were shouting at each other, making every attempt to get each other in place and pumped up. I know today was a somewhat rough result, but West Brom are a decent team this year and I love the feel about our team right now, so let's look for the positives and look forward to Norwich on October 19th.